Rainbow cookies: not bitter, just sweet. A work colleague went to Italy not long ago. He went to Italy to meet up with his boyfriend in Rome. Yes, they were meeting in Rome. You see, his beau works and lives in Iraq. He has one of those jobs that Harlequin romance heroes and/or grown-ups have. Then, after their romantic reunion, they were going off on a Mediterranean cruise. I am so happy for him. Sure, I could cite several valid reasons for being, say, um, bitter. Maybe because the most exotic local I will be visiting this year will be Knoxville, Tennessee. (No offense Knoxville, just saying.) And it might be that the most romantic moment I have had of late is when this guy in my neighborhood named Donald asked me if I was “getting any.” I mean, he did ask after inquiring if I was attached. I lied and said I was. So I guess it was kind of him to make sure I was getting the most of my imaginary relationship. Okay, maybe not. So, yes, I could be bitter. But being bitter is not going to get me to Italy. Being bitter is not going to get me a Harlequin-like love to reunite with whilst in Italy. Honestly, being bitter is not going to get me a damn thing except maybe a few frown lines and enough ill will festering inside to constipate an elephant. And then I am just bitter and uncomfortable. And no one wants that. So I decided to make a change, a small change. I took that bitter and sweetened it with a little a la mode. After all, my colleague is a good and kind person. And who better for something like that to happen to, if not me, than say, a good and kind person. So instead of wallowing in my own bitterness or jealousy, I was going to celebrate his good fortune. Because why can’t his good fortune be mine as well. If I am happy for him, than I am happy. Who says my happiness can only come from things I do. So, win-win for me. So, in honor of his Italian sojourn, I convinced another work colleague that we should each bring something in to work that week to put us in an Italian frame of mind. Her contribution was delightful and fit for a post of its own. My contribution? Rainbow cookies. To say I love these cookies is an understatement. I would marry them, I would. And then I would divorce them just so I could marry them again. They look intimidating to make I know. But I stumbled on a recipe for them and it turns out they are surprisingly simple to make. Really the only intimidating aspect of the recipe, other than my not owning a standing mixer, was the number steps it takes to make them and the number of pans and bowls used in the process. Now, the recipe does result in approximately 96 cookies. So since there are only five or so people in my corner of the newsroom, I walked around the rest of it and dropped a few cookies here and there at people’s desks. (The wonderful thing about newsrooms is that journalists will pretty much eat anything, particularly if it is free and/or comes in the mail. Honestly, pretty much any food left on our desks. No questions asked.) So as a result, I found more happiness out of the situation just spreading the love. Win-win-win. So the next time you hear someone else’s good fortune you may feel jealous or bitter for a moment. That is okay, we are all human. If it was not normal to feel that way than those emotions would not exist. Just let that feeling pass as fast as you can and give in to or find the sweetness of the situation. Find the joy you receive just being happy for someone. You don’t have to necessarily bake to revel in it, but I find it helps. 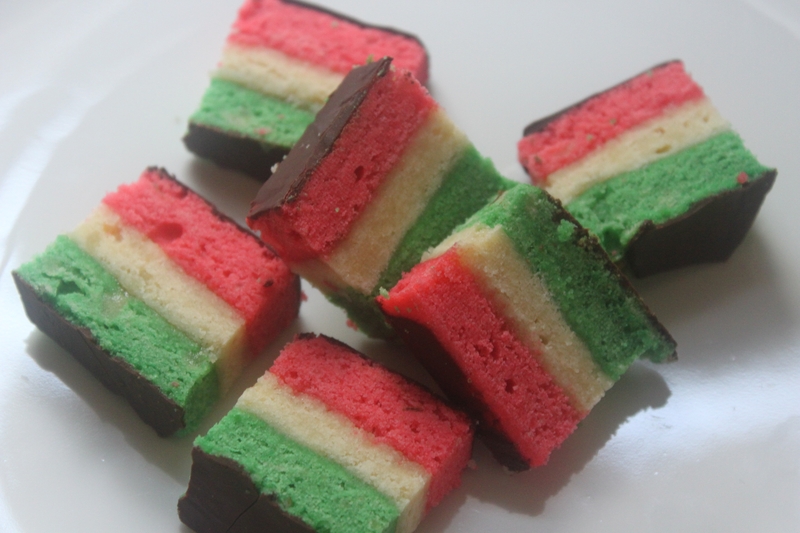 Click here for Bon Appétit‘s simple recipe for Rainbow Cookies, from the May, 2011 The Italy Issue. Delightful – both the cookies and your attitude 😉 Thanks for the recipe!